Survey pegs gun-control approval at 76 percent. As President Barack Obama tearfully announced on Tuesday his intention to circumvent Congress to enact stricter gun laws, a survey showed that Utahns are overwhelmingly in favor of more stringent gun-control measures. 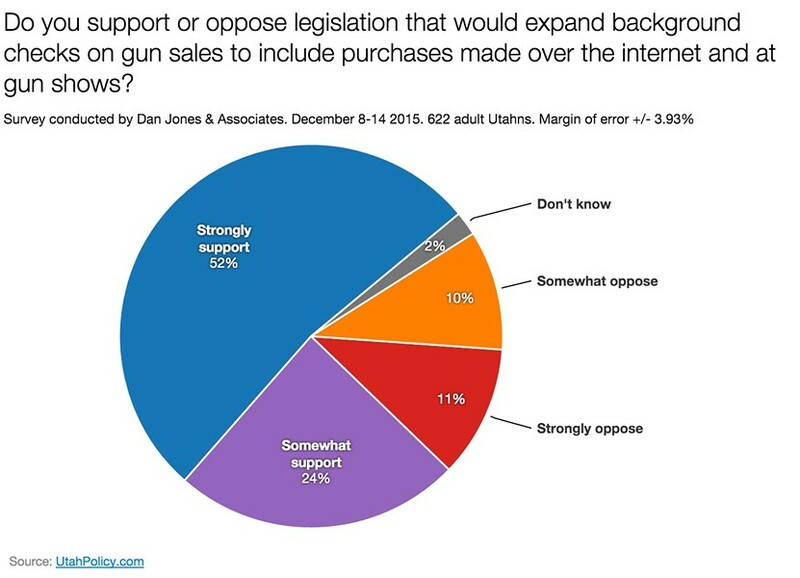 The survey, released by UtahPolicy.com, shows that 76 percent of Utahns are either strongly or somewhat in favor of expanding background checks for weapons purchased over the Internet or at gun shows. The survey showed wide bipartisan support for such legislation, with 70 percent of Republicans and 97 percent of Democrats supporting stricter laws. Surrounded by victims of mass shootings, a tearful Obama implored congress to take the lead. But as lawmakers over the years have repeatedly balked at Obama’s gun control efforts, the president said he would do what he could without their help. Among the measures that Obama is expected to seek include clarifying existing laws to expand the number of people required to undergo a background check before purchasing a firearm, and hiring more personnel to complete background checks. Republican lawmakers, including Utah Sen. Mike Lee, were quick to criticize Obama’s announcement. In a news release, Lee said it was “unfortunate that President Obama chose to mislead the American people today by claiming to close supposed ‘loopholes’ in existing law that never existed. "People engaged in the business of selling firearms had to perform background checks on all purchasers before today, and they still have to perform those same background checks tomorrow,” Lee said. But in gun loving Utah, only 11 percent of 622 adult Utahns surveyed said they strongly opposed stricter gun-control laws, while 10 percent somewhat opposed the efforts. The survey was conducted by Dan Jones & Associates and has a margin of error of +/- 3.93 percent.